Monrovia High's robotics team, The Kings and Queens, won second place, the Inspire Award, at the LA Region Qualifying Tournament this weekend in Perris, California. The Inspire Award is actually the highest award that can be earned by a FIRST Tech Challenge robotics team at a competition. The criteria for the award is: "This formally judged award is given to the team that truly embodied the ‘challenge’ of the FTC program. The team that receives this award is chosen by the judges as having best represented a ‘role-model‘ FTC Team. This team is a top contender for all other judging categories and is a strong competitor on the field. The Inspire Award Winner is an inspiration to other teams, acting with Gracious Professionalism™ both on and off the playing field. This team is able to communicate their experiences, enthusiasm and knowledge to other teams, sponsors, and the Judges. Working as a unit, this team will have demonstrated success in accomplishing the task of creating a working and competitive robot." 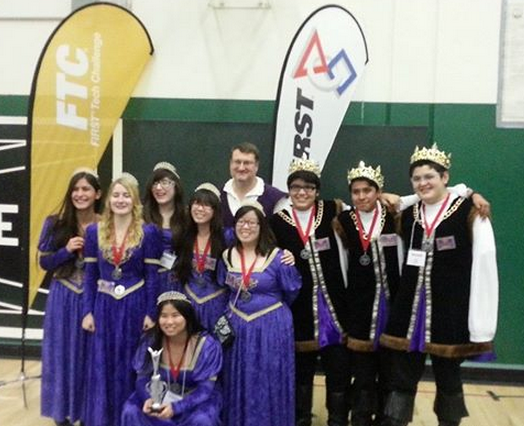 In addition to the recognition and honor of being selected as the top team at the tournament, winning the Inspire Award gives the Kings And Queens an automatic slot in the Los Angeles Regional Championship Tournament to be held in Monrovia on February 14th which is our next step to our goal of qualifying for the World Championship for a second year.